Improved public space, a transport interchange and better pedestrian links are all options the public are being asked to consider for the Haymarket area to tie-in with the redevelopment of the train station. Richard Murphy Architects to be the architects for Tiger Developments, winning this prestigious project at the western entry to Edinburgh, formerly masterplanned by Reiach and Hall Architects and the site of a controversial Architecture Review competition. Thirteen bids were received, four reported as being shortlisted. Tiger Developments are part of O’Flynn Construction Group. Other projects by Tiger Developments include City West Leeds and Harbour Island Docklands. Due to Edinburgh City Council financial issues – namely locating finance for female employees underpaid for years – EDI were reportedly disbursing of some of their portfolio in Spring 2006. 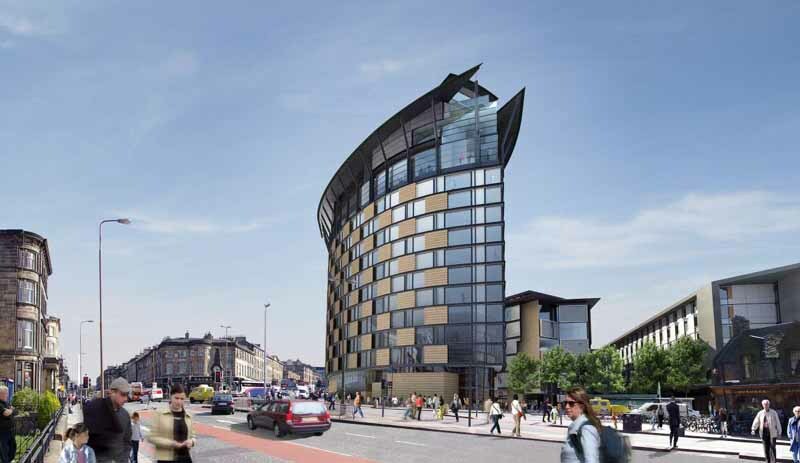 The Haymarket site has planning permission for a design by Reiach and Hall Architects but the site went under offer by Jones Lang LaSalle, with a closing date reported as 23 Jun 2006. This is a major site and will attract interest from architects outwith Scotland. Further announcements are expected later in Summer. 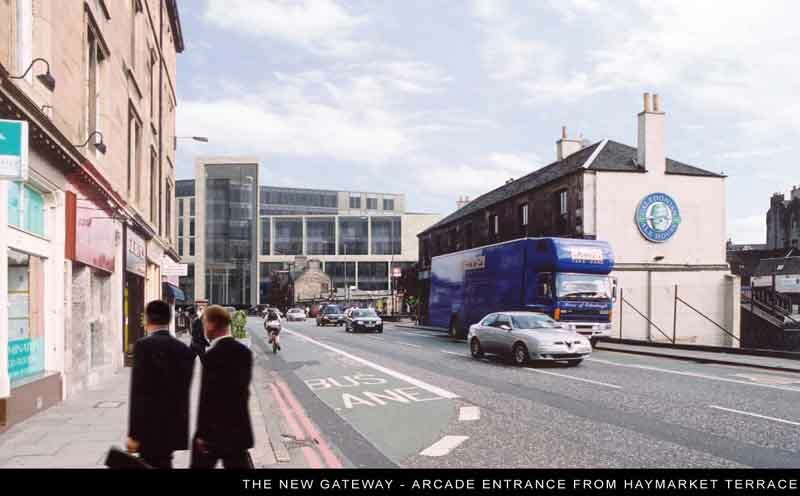 A major new office development and spectacular public arcade on a derelict site in Edinburgh’s city centre today (11.08.04) got the green light from councillors on the planning committee. The Haymarket – as the scheme is known – will offer a lively business, shopping and leisure hub at the western gateway to the city centre. 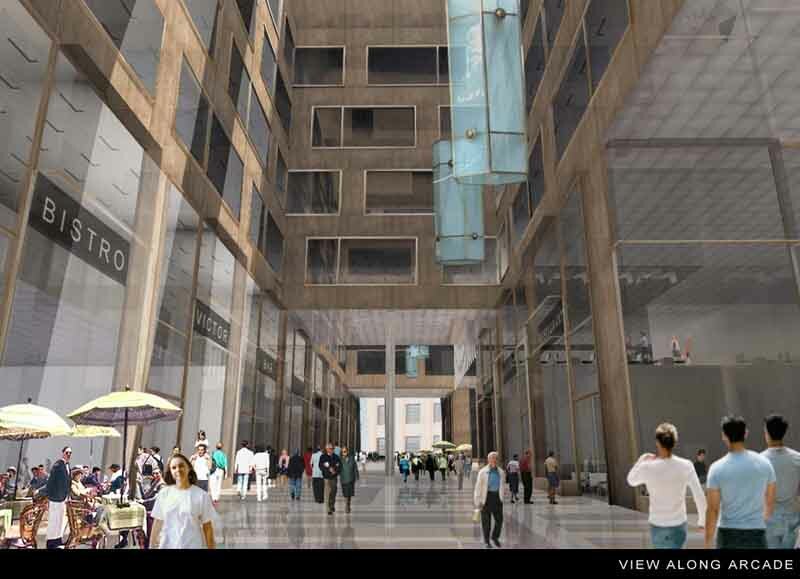 Offices, shops, bars and cafés will be ranged around a spectacular, European-style, 5-storey public arcade and square. Located on the former Morrison Street goods yard – one of the last major gap sites in Edinburgh’s centre – the scheme is set to regenerate a site that has lain almost derelict for 40 years. EDI believe that the landmark development has the potential to energise the local area and provide a route through the city’s growing financial district. Phase 1 of the development will offer 32,487 sq m of offices, retail, leisure, licensed premises and car parking on a 1.767 ha site close to Haymarket Station. 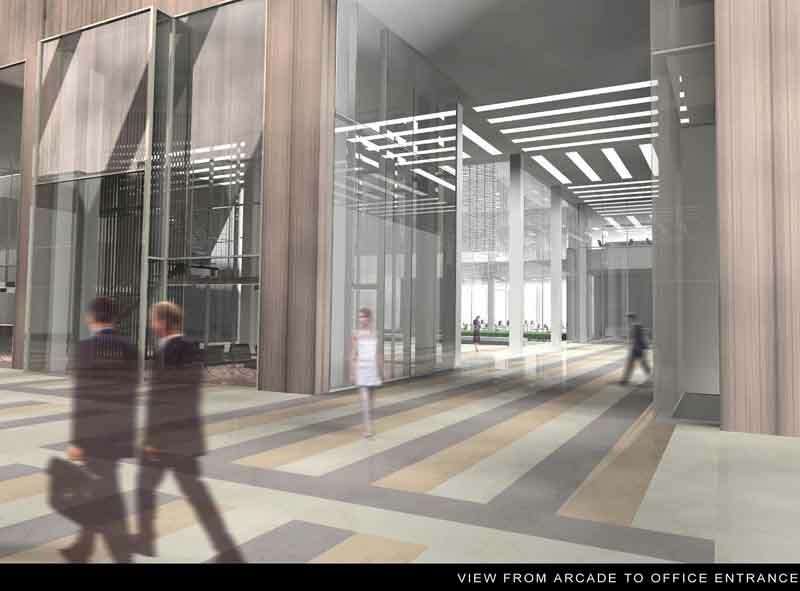 There will be a “city-store” style supermarket accessed from the arcade via an open courtyard. The architecture of this first phase of the development is of a high quality contemporary design by Edinburgh-based architects, Reiach and Hall. The firm swept the board at this year’s Scottish Design Awards, winning an unprecedented five awards including Architect of the Year 2004 for Neil Gillespie, design director of Reiach and Hall. In developing their proposals for The Haymaket, Reiach and Hall studied arcades across the UK and Europe to incorporate into their design the elements that give famous European arcades their special qualities. These include excellent lighting and high quality finishes on shop fronts and flooring. The Haymarket arcade, which will extend to the roof of the building and will be lit by a glass roof, will be lined by shops and cafes on two levels. The developers hope that it will also provide a striking indoor space suitable for music and theatre performances and events such as tea dances or lectures. The scheme sits on a prominent corner site alongside two conservation areas and the World Heritage Site of Edinburgh’s city centre. Following its earlier refusal by the planning committee, the design of the scheme was amended to meet the concerns expressed. Asked about the new development, EDI Chief Executive Ian Wall said: “This important site, one of the last gap sites in the city centre, demands a development of character, scale and ambition to mark the western edge of Edinburgh’s city centre. We believe that our Haymarket proposal meets this challenge. This first phase, designed by architects Reiach and Hall will be complemented by two further phases, to be designed by Page & Park Architects and Allan Murray Architects respectively. Ian White Associates are acting as landscape architects on all phases and sustainability consultants Third Wave are employed to ensure that the building anticipates best environmental practice on issues such as waste and energy use. The EDI Group Limited is a private company which is 100% owned by City of Edinburgh Council. The EDI Group carries out a range of property development from office and retail through factories to housing for the homeless. It combines a commercial approach with a commitment to bringing architectural, environmental and social benefits to and through its projects. EDI’s wide ranging project portfolio includes office developments, retail properties within Edinburgh’s Old Town, Edinburgh Park, the long-term regeneration of Craigmillar, Princes Street Galleries and residential schemes throughout Edinburgh. It operates mainly in the Edinburgh City region, but it has also a presence in Glasgow and North Ayrshire. Morrison Link proposals refused on 6 Nov 2003 by CEC Planning 6 votes to 5. Project by Reiach and Hall Architects for EDI reported to be refused partly due to mix of uses. The issue of an Architecture Centre was apparently discussed, possibly recalling the original AR competition; affected by developments at Haymarket Station. Strong and dense proposals including Galleria parallel to Morrison St: it is important that the new route is open 24 hrs a day – unlike some in The Exchange, Edinburgh – and efficiently linked to the railway station. Morrison Street car park site purchased by EDI (reported to be concluding 2003) and mixed use retail-orientated scheme to be developed by EDI: unveiling of images in mid-Sep 2002 with comments by Olle Wiig of Narud Stokke Wiig created controversy which snowballed with Norwegian Consulate + RFACS representations, then involvement of Cockburn, EWHT, etc. in late Sep 2002. The EDI Group has resubmitted its proposals for a major office and retail development at Haymarket to the planning authorities. Buredi [partnership between The Burrell Company and EDI] are also involved in the refurbishment of the former Traverse Theatre, West Bow (east end of Grassmarket) with Lee Boyd Architects and redevelopment of the former Greyfriars Hostel into contemporary residential apartments. On the other side of Lothian Road Buredi are working with Allan Murray Architects to create a development around a ‘new street’ in the Fountainbridge district located on vacant land to the south of Fountainbridge Brewery. 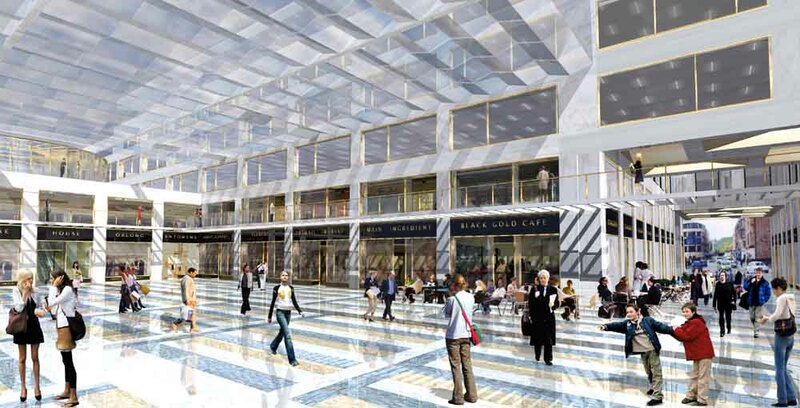 Scottish Ministers today (20/12/05) approved a major new office development and spectacular public arcade by EDI that is set to breathe new life into a derelict site in Edinburgh’s city centre following an extensive Public Inquiry. “We are very pleased with the outcome of the Public Inquiry. We appointed a very strong design team, gave them a demanding commercial and social brief and worked closely with the Council planning department to produce a great scheme. It is gratifying to see this recognised by the Minister. Located on the former Morrison Street goods yard – one of the last major gap sites in Edinburgh’s centre – the scheme is set to regenerate a site that has lain almost derelict for 40 years. The scheme will offer offices, shops, bars and cafés ranged around a spectacular, European-style, 5-storey public arcade and square. Designed by the award winning firm of Edinburgh architects, Reiach and Hall, Phase 1 of the development will offer 32,487 sq m of offices, retail, leisure, licensed premises and car parking on a 1.767 ha site close to Haymarket Station. There will be a “city-store” style supermarket accessed from the arcade via the new square. The Haymarket arcade, which will extend to the roof of the building and will be lit by a glass roof, will be lined by shops and cafes on two levels. In developing their proposals, Reiach and Hall studied arcades across the UK and Europe, incorporating into their design the elements that give famous European arcades their special qualities. Plans for a major new development that will provide a landmark western “gateway” to Edinburgh city centre were unveiled today. The development at Morrison Street goods yard, which will see award-winning developers EDI together with City of Edinburgh Council, redefining Haymarket as a vibrant and accessible area of the Capital – both for business and leisure. The project will benefit also other parts of Edinburgh, with a large chunk of the profits earmarked for investment in regeneration areas across the city. The Morrison Link development is planned for three phases, with the first phase alone set to see investment of around £70 million to provide new offices, shops, restaurants and bars, and lively new public squares and thoroughfares. Central to the design is a five storey Haymarket arcade, with a grand portal entrance , running the length of the site and leading to, in the middle, a spacious plaza surrounded by shops and cafes. EDI has a proud track record of success in Edinburgh, with partnership projects such as the successful Gyle Shopping Centre, Clocktower Estate and Edinburgh Park which was recently named as one of Europe’s leading business locations. Leading firms of Scottish architects are to be involved throughout the three phases of the work with the project set to showcase the very best of national talent. New public thoroughfares linking to the city’s financial district and city centre with Haymarket Rail Station. The landmark development will be superbly well served by transport links, with ease of access to main roads out to the west of the city and the close proximity of Haymarket railway station. EDI Chair, Lezley Cameron, said: “The proposals would see the last major city centre gap site in Edinburgh developed in the most positive of ways. “Our record of working with the council shows that we deliver the highest quality of developments for the city, a benchmark against which others can be measured. Edinburgh Park, for example, is quite simply the best business park in Scotland – by a long way. “This development will follow that tradition of excellence, and will showcase that the best that Scotland has to offer in terms of the design and construction of a major new city block which will stand comparison with the best. In addition, the development will create jobs. Once the three phases of development are completed, around 5000 people are likely to work on the site. Ian Wall, Chief Executive of EDI added: “The site is the gateway into Edinburgh from the west. That means we want to ensure that the quality of development matches our aspirations for such a key site, which will transform this part of the city. The design by Edinburgh architects Reiach & Hall responds to the surrounding developments in a variety of ways whilst creating a keynote building whose five storey entrance represents the confidence and strength of the building. The external materials include sandstone with the arcade being of natural stone and wood. EDI Group was established by the City of Edinburgh Council in 1988 to carry out the development of Edinburgh Park, and since then has worked on most forms of property from office and retail through to factories and housing for the homeless. One of the EDI Group’s key roles is to act in partnership with the public and/or private sector on specific projects which are not only profitable but bring added value in respect of architectural, environmental and economic development benefits.